An asbestos removal project has been completed in a dry air plant in the X-333 Process Building of the former gaseous diffusion plant at the Department of Energy’s Portsmouth Site in Piketon. A team member works inside the containment area for the asbestos removal project in a dry air plant of the X-333 Process Building at the Department of Energy Portsmouth Site in Piketon. Removal of the material requires exten­sive covering, sealing and filtered vacuuming to assure safe abatement. Clean-up work was assumed by the DOE’s primary D&D contractor at the Site, Fluor-B&W Portsmouth LLC, in March 2011. 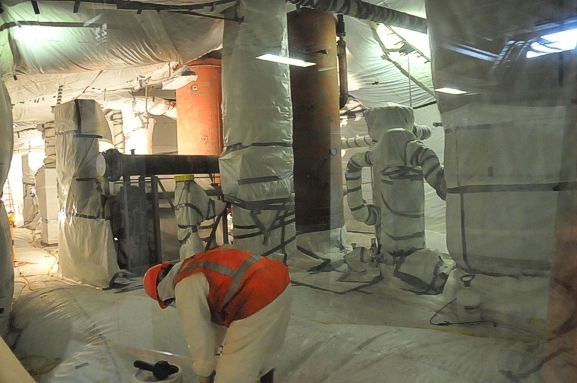 In partnership with Wastren Advantage, Inc. (WAI) of Piketon and sub-contractor Solid Rock of West Portsmouth, Fluor-B&W D&D operations were able to remove asbestos associated with antiquated and contaminated facilities that were part of the Cold War-era uranium enrichment process. Industry consensus is that asbestos in good condition, undisturbed, is safe. Since the older buildings are expected to be demolished, including the X-333, the asbestos must be removed within safe parameters established by the Ohio Environmental Protection Agency and the Ohio Department of Health. The X-333 dry air plant asbestos project began in November and required support in several specialized areas, said Fluor-B&W Demolition Manager Ken Shinkle. Superintendent Jay Smoyer said the asbestos is removed while contained inside special “glove bags” and a filtered vacuum system assures no material is released. The material is then removed and packaged into containers under Department of Transportation standards and shipped out of the area to an appropriate facility for disposal of contaminated asbestos.